In their ‘revised channel flow model’, Wang et al. postulated from the Nyalam region of south central Tibet that a protracted partial melting for ~ 26 Ma at mid-crustal depth of ~ 30-40 km and a southward ‘long lived channel flow’ exhumed the Greater Himalayan Crystallines (GHC). The work is a valuable addition in refining exhumation model of the GHC (latest review in Mukherjee, in press-1). Denudation from top and buoyant force from bottom drove the channel flow. These resulted a pressure gradient of 2-3 kbar km-1 in the lower GHC and < 0.5 kbar km-1 in the upper part (Wang et al., in press). The new conjectures are (i) N/NE dipping Main Central Thrust (MCT) developed during 27-14 Ma when the partially molten material extruded, and (ii) the molten material did not occupy the entire GHC/channel, but moved up selectively through its upper part. Though not explained in detail, heat convection has been cited as a reason for such a path of the fluid. Here I discuss Wang et al.’s (in press) work into the following points. I. Are OOSTs inside the GHC uncommon? Wang et al. also reported the ‘Nyalam Thrust’ (NT) as an out-of-sequence thrust (OOST) within the GHC ~ 5 km S/SW to the Nyalam village (see their fig. 3). They stated that OOSTs are rather uncommon within the GHC in different river sections. This is not correct since Mukherjee et al. (2012) reviewed OOST (see their fig. 1 and table 1) from nine locations along the Himalayan chain in India, Nepal and Bhutan. In addition, Warren et al. (2011) referred the ‘Laya Thrust’ in GHC, Bhutan as possibly an OOST, which was active during ~ 21-17 Ma (Grujic et al. 2011) or within a much younger range of ~ 14-10 Ma (Warren et al. 2011). Considering all the geochronologic data of the timing of these OOSTs (Grujic et al., 2011; Warren et al., 2011; review by Mukherjee et al., 2012), it can be stated that they were top-to-S/SW sheared from ~ 22 Ma till the Holocene Period. Fig. 1 reproduces the map of the Himalaya and show all the known eleven locations within the GHC where the OOST has been reported. Fig. 1: The out-of sequence thrust (OOST) is delineated through altogether eleven locations of the GHC. The Himalayan orogen map is reproduced from Godin et al.’s (2006) fig. 1. References: fig. 1 of Mukherjee et al. (2012): Chaura/Sarahan, Toijem, Kalopani, Modi Khola, Physiographic Transition (PT), Khumbu, High Himal Thrust (Hi), Kakhtang, Zimithang; Warren et al. (2011): Laya; Wang et al. (in press): Nyalam. The 6 to km 50 thick GHC along the Himalayan chain has recently been divided broadly into a lower non-migmatitic unit (the lower GHC: GHCL) at S/SW and an upper migmatitic and granitic unit at N/NE (the upper GHC: GHCU; Larson et al. 2010; also see Mukherjee & Koyi, 2010). Whether the OOST plots entirely either within the GHCL or the GHCU, or at their contact, is important since in the latter case, Carosi et al. (2007) postulated rheological contrast as a mechanism of their genesis. The GHCU can extrude faster than the GHCL, defining an OOST in between, since the former consists of rocks softer than the latter in lower Dolpo section in western Nepal (Carosi et al., 2007). Wang et al.’s NT plotted ~ 35 km S/SW to the Nyalam Detachment (= South Tibetan Detachment: STD) of a different research group: Wang et al (2006). Figure 11c of Wang et al. (in press) shows that the NT falls inside and near the S/SW extremity of the migmatitic GHCU. Therefore Carosi et al.’s (2007) model cannot explain accurately the genesis of the NT. Note that in the western Himalaya, the OOST, locally known as ‘Chaura Thrust’ (Jain et al., 2000)/ ‘Sarahan Thrust’ (Chambers et al., 2010) falls well inside the non-migmatitic lithology much south to the STD. The relative locations of all the eleven exposures of the OOSTs inside the GHC are plotted in Fig. 2. Fig.2: Schematic presentation of relative locations of the OOST inside the GHC: Ka1, Ph, Ka2, Ch, Kh, Hi, Zi To, Kl, Mo, La, and Nm. 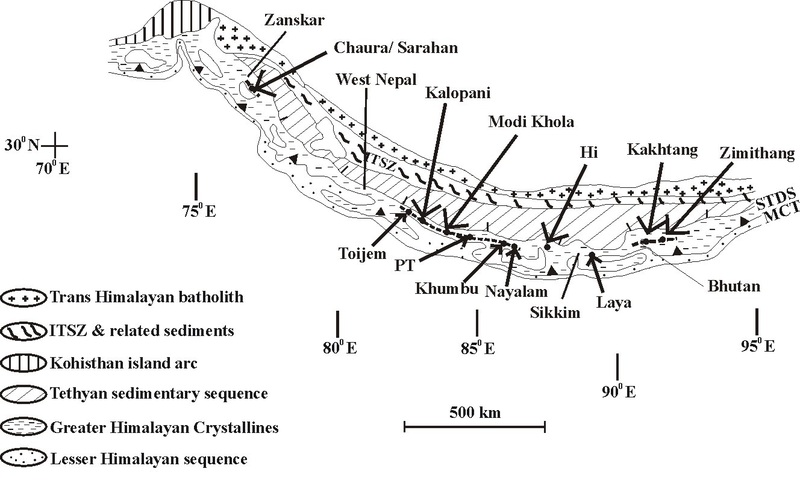 Symbols: Ka1: Kakhtang Thrust, Ka2 Kakhtang Thrust, , Hi: High Himal Thrust, Ch: Chaura Thrust, Kh: Khumbu Thrust; Zi: Zimithang Thrust, To: Toijem Shear Zone, Kl: Kalopani Shear Zone, Mo: Modi Khola Shear Zone (reproduced from fig. 4 of Mukherjee et al., 2012); and Nm: Nyalam Thrust (calculated from fig. 3 of Wang et al.). Other symbols are defined in caption of Fig. 1. The concept of restricted channel flow in the GHC, as proposed by Wang et al. (in press; their fig. 11), is not new. Based on thermobarometric studies, Hollister & Grujic (2006) proposed that the GHC in Bhutan Himalaya extruded due to pulsed channel flow (Fig. 3). The latest third pulse during ~ 12-10 Ma was restricted within the northern part of the GHC, with Kakhtang Thrust (KT, a local name for the OOST) at S and the STD at N. However, these authors did not explain why the partially molten material extruded through exclusively the northern part of the GHC. Subsequently, Mukherjee et al. (2012) described a confined nature of extrusion by channel flow within the northern part of the analogue modeled GHC. In their work, a Newtonian viscous synthetic organic polymer polydimethylsiloxane (PDMS) was pushed inside a horizontal channel and was allowed to extrude through a linked inclined channel equivalent to the GHC (Fig. 4). The PDMS originally in the horizontal channel was found to extrude preferably through the upper portion of the model GHC and did not occupy the entire GHC. The contact between the PDMS originally within the GHC and that coming from the horizontal channel was defined as a blind OOST that cropped at the model surface during the late phase of experiments. Notice that these analogue models were performed at constant and normal room temperature taking a homogeneous PDMS without any artificial erosion for the extruded portion. Therefore, the OOST did not develop by any thermal convection in contrary to Wang et al.’s postulation, nor did lithological heterogeneity (Carosi et al. 2007) or differential erosion due to rainfall (Harris 2007) play any role. It appears that the OOST developed due to purely the mechanical reason of flow of fluid from a horizontal channel (or a flat) into an inclined channel/GHC (the ramp) (Mukherjee et al., 2012). Fig.3: A simplified sketch showing late phase of crustal channel flow was confined within the upper portion of the GHC, by the STD at N/NE and the OOST at S/SW. N/NE dipping MCT and STD bound the GHC. Simplified from fig. of Hollister & Grujic (2006) and reproduced from fig. 14b of Mukherjee et al. (2012). Fig.4: A cartoon of analogue model results reproduced from fig. 12b of Mukherjee et al. (2012). PDMS in a horizontal channel was pushed from right and a channel flow developed. When this flow extrudes through a linked inclined channel equivalent to the STD, it confines to the upper portion of the latter. The half arrow denotes the blind out-of-sequence thrust. Wang et al. described the MCT as a ‘thrust sense shear zone’. This looks a too simplistic description for the entire Himalayan chain since down-dip top-to-N/NE extensional shear has also been documented from the MCT-zone at Langtang transect, Nepal (Takagi et al., 2003), Sutlej section, India ( Vanny et al., 2004; Mukherjee & Koyi, 2010), and recently from the Mangde Chu river section, Bhutan (Jain et al., 2012), and Bhagirathi section, India (Mukherjee, in press-2). The zone of extensional shear was designated as the ‘South Tibetan Detachment System-Lower’ (STDSL; Mukherjee & Koyi, 2010), and as a ‘Basal Detachment’ (BD; Mukherjee, in press-2). However, notice that no extensional ductile or brittle shear has been reported from the MCT-zone in the Nyalam section where Wang et al. worked. Therefore, Wang et al.’s tectonic model summarized in their figs. 11a-c, where no extensional shear of the lower boundary of the GHC (i.e. the MCT) is permitted for the Nyalam region, requires modifications if applied to GHC along other river sections. Acknowledgements: Supported by Department of Science and Technology’s (New Delhi) grant: IR/S4/ESF-16/2009(G). Carosi, R., Montomili, C., Visonà,` D., 2007. A structural transect in the lower Dolpo: insights in the tectonic evolution of Western Nepal. Journal of Asian Earth Sciences 29, 407–423. Hollister, L.S. & Grujic, D., 2006. Pulsed channel flow in Bhutan, Geol. Soc. Spec. Publ., 268, 415–423. Jain, A.K., Singh, S., Sushmita, Seth, P. & Shreshtha, M., 2012. Structurally controlled melt formation and accumulation: evidence for channel flow in the Himalaya. Abstract in 27th Himalaya–Karakoram–Tibet workshop (HKT). Journal of Nepal Geological Society 45, 2. Larson, K.P., Godin, L. & Price, R.A., 2010. Relationships between displacement and distortion in orogens: linking the Himalayan foreland and hinterland in central Nepal. Geological Society of America Bulletin 122, 1116-1134. Mukherjee, S., In press-1. Channel flow extrusion model to constrain dynamic viscosity and Prandtl number of the Higher Himalayan Shear Zone. International Journal of Earth Sciences. Mukherjee, S., In press-2. Higher Himalaya in the Bhagirathi section (NW Himalaya, India): its structures, backthrusts and extrusion mechanism by both channel flow and critical taper mechanisms. 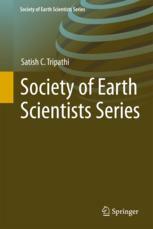 International Journal of Earth Sciences. Mukherjee, S. & Koyi, H.A., 2010. Higher Himalayan Shear Zone, Sutlej section: structural geology and extrusion mechanism by various combinations of simple shear, pure shear and channel flow in shifting modes. International Journal of Earth Sciences 99, 1267–1303. Mukherjee, S., Koyi, H.A. & Talbot, C.J., 2012. Implications of channel flow analogue models for extrusion of the Higher Himalayan Shear Zone with special reference to the out-of sequence thrusting. International Journal of Earth Sciences 101, 253–272. Streule, M.J, Strachan, R.A., Searle, M.P. & Law, R.D., 2010. Comparing Tibet– Himalayan and Caladonian crustal architecture, evolution and mountain building processes. In: Law, R.D., Butler, R.W.H., Holdsworth, R.E. et al (eds) Continental tectonics and mountain building: the legacy of peach and hone. Geological Society of London Special Publication 335, 207–232. Takagi, H., Arita, K., Sawaguchi, T., Kobayashi, K. & Awaji, D., 2003. Kinematic history of the Main Central Thrust zone in the Langtang area, Nepal. Tectonophysics 366, 151–163. Vannay, J-C, Grasemann, B., Rahn, M., Frank, W., Carter, A., Baudraz, V. & Cosca, M., 2004. Miocene to Holocene exhumation of metamorphic crustal wedges in the NW Himalaya: evidence for tectonic extrusion coupled to fluvial erosion. Tectonics 23, TC1014. Wang, J.M., Zhang, J.J. & Wang, X.X., In press. Structural kinematics, metamorphic P-T profiles and zircon geochronology across the Greater Himalayan Crystalline Complex in south-central Tibet: implication for a revised channel flow. Journal of Metamorphic Geology. Wang, Y., Li, Q. & Qu, G., 2006. 40Ar/39Ar thermochronological constraints on the cooling and exhumation history of the South Tibetan Detachment System, Nyalam area, southern Tibet. In: Law RD, Searle MP (eds) Channel flow, extrusion and exhumation in continental collision zones. Geological Society of London Special Publication 268, 327-354. Warren, C.J., Grujic, D., Kellett, D.A., Cottle, J., Jamieson, R.A. & Ghalley, K.S., 2011. Probing the depths of the India-Asia collision: U-Th-Pb monazite chronology of granulites from NW Bhutan. Tectonics 30, TC2004. Yakymchuk, C. & Godin, L., 2012. Coupled role of deformation and metamorphism in the construction of inverted metamorphic sequences: an example from far-	northwest Nepal. Journal of Metamorphic Geology 30, 513–535.